Right now, you can get in on the Kickstarter for "Geeky Sprinkles: Fun Sprinkle Shapes for Geeky Baking" run by Tara Theoharis of Geeky Hostess and combine your love of all things nerdy with your love of cupcake baking. Via technabob. Blue Police Box Sprinkles: Blue British police box confectionary shapes. Whether you're an avid fan of old police boxes, or just have a thing for time travel, these will add some timey-wimey flair to your fish fingers and custard. Steampunk Sprinkles: Gear and nut confectionery shapes in a mix of gray, yellow, and brown. Fantastic for steampunk cupcakes, construction-themed parties, or robot confections. Lightning Bolt Sprinkles: Yellow lightning bolt confectionary shapes. Add them onto your X-Men cupcakes, coat a rainbow cake in them, or sprinkle them on top of your Butterbeer. 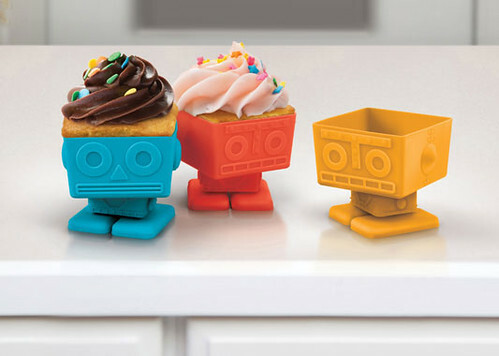 Unrelated to the Kickstarter but also fun and geeky: Yumbots (robot cupcakes), pictured below. Find out more at The Geeky Hostess.